After much teasing, Mercedes-Benz has formally taken the wraps off the its EQC SUV. The EQC will mark the luxury brand’s first mass-market pure-electric vehicle and launch its new EQ electric sub-brand when it goes on sale next year. Unsurprisingly, the EQC looks a lot like the Generation EQ concept Mercedes revealed at the 2016 Paris Motor Show. The company never hid the fact that concept was intended to preview the real deal, and indeed, it did just that. The EQC looks like a production version of the 2016 concept; meaning it has a real grille versus the shiny LED display grille found on the concept. Other attributes, such as a more aerodynamic shape, also round out the changes when it comes to translating the concept to production. Given this is Mercedes’ first real electric vehicle, the story is really what is powering the EQC. In that regard, the electric SUV is packing two electric motors; one at each axle, meaning all EQC’s are all-wheel-drive. An 80-kWh lithium-ion battery pack will supply electric juice to both motors, which will spin out 402 horsepower and 564 pound-feet of torque. 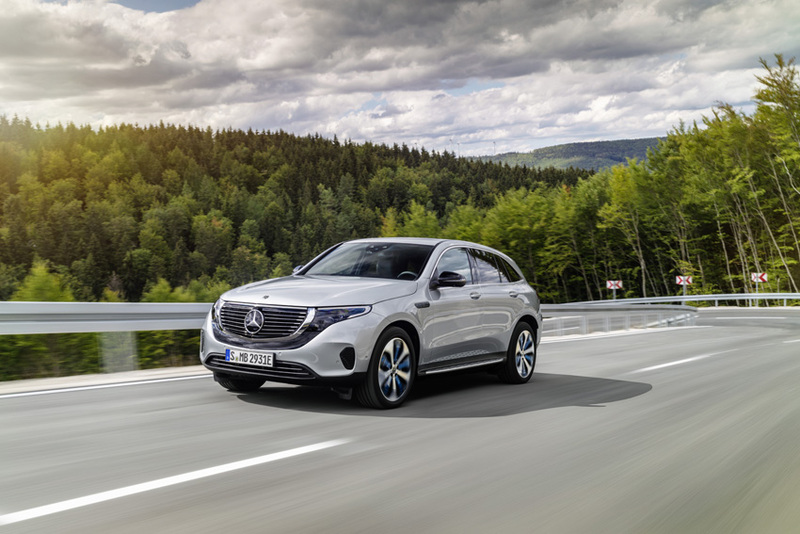 Mercedes-Benz says the powertrain will propel the EQC from zero to 60 mph in 4.9 seconds, while the battery will supply power for about 279 miles of range, depending on driving style. Mercedes’ first EQ product is also packing some unique features to help mold driving styles in the EQC. Leveraging an accelerator pedal that offers haptic feedback, ECO Assist will coach drivers on when they should let up on the accelerator–such as when the speed limit changes–to help maximize the EQC’s electric range. Despite this coaching, the EQC will still offer a range of drive modes, including Sport, like other Mercedes-Benz products. 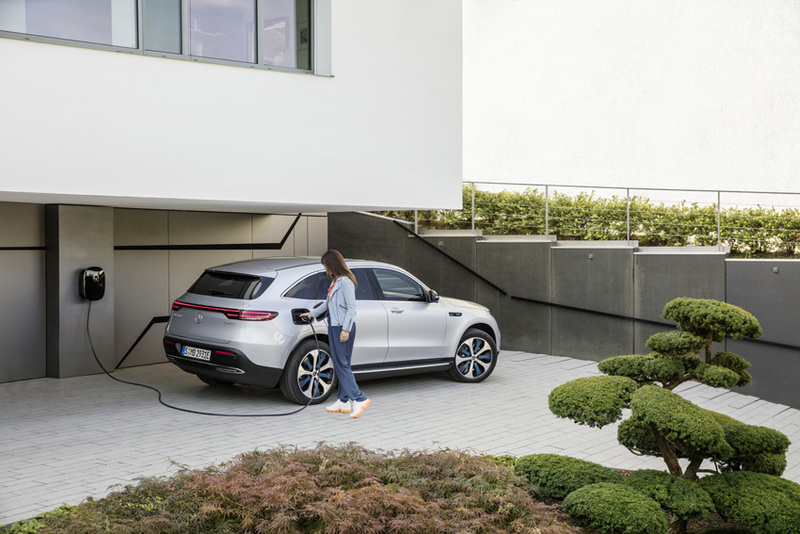 All EQC’s are equipped with a water-cooled onboard charger (OBC) with a capacity of 7.4 kW, making it suitable for fast AC charging at home or at public charging stations. Charging at a home wallbox is up to three times faster than at a domestic power socket. It is faster still with DC charging – which is standard for the EQC – for example via CCS (Combined Charging Systems) in Europe and the USA. Depending on the SoC (status of charge), the EQC can be charged with a maximum output of up to 110 kW at an appropriate charging station. Inside, the EQC is a mix of typical Mercedes-Benz interior bits and unique-to-EQ design traits. The brand’s two-panel LCD display is found within the gauge cluster, while the standard-fare piano black center stack is housed below a unique looking HVAC vent layout. 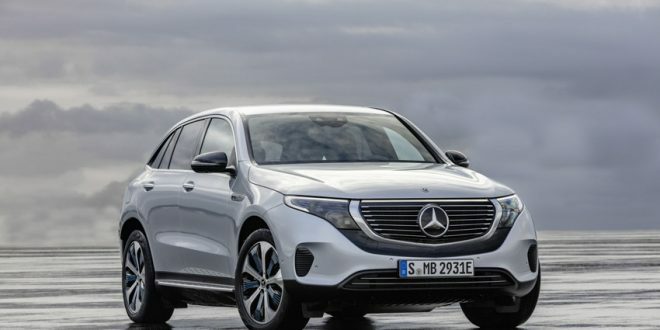 Mercedes will begin rolling out the EQC globally next year, with plans for it to arrive in the U.S. in 2020. Definitely the worse part of the exterior design. The Audi E-Tron and I pace looks so much better. This thing already looks dated, IMO.